100 Bugs! is available at all of the above vendors. If you would like an autographed copy, please order from The Concord Bookshop button below. ​Kirkus Reviews Starred: "Packed with great extension possibilities, visually engaging illustrations, and quick rhymes, this read-aloud would be a great addition to any STEM shelf. (Picture book. 3-6)"
Publisher's Weekly: "In this cheerful outing, two sibling “explorers” wake up with the sun to count bugs over the course of a day on their busy farm. As the brother and sister traipse through a meadow and barnyard with a magnifying glass and a butterfly net, Narita introduces insect varieties in upbeat rhymes." Elizabeth Broughton won No Monkeys, No Chocolate. Pam Trefy won Anybody's Game. Gail Hedrick won Goldenlocks and the Three Pirates. Christine McMahon won Madame Martine. Allyson Gill won B is for Berkshires. Jessie Oliveros, author of The Remember Balloons, interviews Kate Narita, author of 100 Bugs! A Counting Book about the inspiration for 100 Bugs! Q: How did you get the inspiration for 100 Bugs! A Counting Book? I’m a fourth grade teacher, and one of the writing mini-lessons I taught this week was that writers get their ideas from a real life moment and then turn the idea into fiction. That’s exactly what happened to me with 100 Bugs! A Counting Book. I was at school, talking with another teacher, Teresa Zuckerman, and she told me that in order for kids to be successful in math they need to understand the combinations of ten. I had an “Aha” moment. I thought, I don’t think there’s a picture book about the combinations of ten. That’s how the idea started! Q: That explains some of the math in the book, but it doesn’t explain the bugs! Where did they come from? That’s a great question, and it has a two-part answer. Dragonflies have always been close to my heart. I grew up in a south suburb of Chicago, Homewood, and I lived four blocks away from my middle school. Next to the middle school were softball fields and the public pool. During the summer, I would ride my bike to the public pool and to softball practice. Large dragonflies zoomed about the field and they filled me with happiness. Now, I live in central Massachusetts on the side of a small mountain. During the summer, dragonflies dart about my yard. There are two weeks in August when there are literally 100 common darners zooming about. Anytime I see a dragonfly, I feel as though the world is a magical place. Anyway, the same day my teacher friend told me about the combinations of ten, I had my writing group. When I was driving home from my writing group, the text came to me, “Dragonflies, dragonflies, zipping all about.” At first, instead of having ten different bugs, I switched back and forth from various species of dragonflies and damselflies. When I took the manuscript to my writing group, they told me to use different bugs. So, then I added butterflies, bumblebees, ladybugs, and lightning bugs. After I submitted the manuscript, the editor told me she wanted ten different bugs including walkingsticks. That’s when the leafhoppers, katydids, spittlebugs and walkingsticks crawled into the story. Q: What about the flowers? Are you some kind of master gardener? Definitely not! I’m embarrassed to say I neglect my yard. But, my parents work really hard to grow gorgeous plants. So, anytime I go to their house, I flip through their gardening magazines. As a result, I know a lot of flower names. Flower names began to flood my mind, and I paired those flower names with objects that would be in the yard of someone who lived on a farm: rose and hose, weather vane and bugbane, horse feed and sneezeweed and so on. Q: Some of the facts in the scientific back matter are pretty cool. Did the inspiration for those facts come from your parents’ gardening magazines as well? No. The scientific back matter came about because of my grit and the generosity of friends. When the editor called me to tell me they wanted to take the manuscript to acquisitions, she said that she knew I worked a full-time job and had a family, but that she wanted scientific back matter on the ten plants and the ten insects within a month. I knew I would get it done, but I also knew I would need help from my friends. First I spoke with April Jones Prince, her book which is also an FSG book, Goldenlocks and the Three Pirates, comes out in November www.apriljonesprince.com/. She reassured me, and told me just to be sure to find a different interesting fact for each insect and plant. So, she meant don’t talk about the size or the color of each item, mix it up. So, I did. Then, I had to ensure the information I was presenting was accurate. In addition to researching online and in libraries, two family friends helped me out. Paul Williams, professor emeritus at University of Wisconsin-Madison and the inventor of Fast Plants helped me understand the coral bell’s reproduction process fastplants.org/resources/digital_library/. Denise Martin, who retired from teaching biology at St. Michael’s College, worked with me to make sure that the ten plants in the book could be found blooming at the same time in the same place. But another challenge was in addition to teaching and parenting, I was also planning and traveling to my grandmother’s one hundredth birthday party in Chicago. Needless to say, I was pretty exhausted. When I took the back matter to my writing group, Melissa Stewart, who is an amazing non-fiction author who has published over one hundred books including Can an Aardvark Bark?, gave me an extraordinary gift www.melissa-stewart.com/. She told me to send her the draft of my back matter and that she would edit it for me and format the information so that everything was presented in a uniform way. Q: Wow! It sounds like the inspiration for this book came from family and friends! It did, and what’s even more amazing is that the inspirational process continued when working with the extraordinary editor of the book, Janine O’Malley, and the incredible illustrator, Suzanne Kaufman suzannekaufman.com/about/. This book is truly a gift from family and friends, and I hope that others will find it’s a gift they can share with their families and friends as well. 10 drafts ago 100 Bugs! featured five damselfly species and five dragonfly species. I’ve always loved dragonflies, and I was fascinated when I discovered damselflies were a different species than dragonflies. Why weren’t there any children’s books about the differences between the species? I thought I’d write one. My writing group convinced me more insect variety would make the story pop. 9 drafts ago 100 Bugs! featured cosmos instead of yarrow. But farrow and yarrow sounds so much better than cosmos and yarrow! My writing group also pointed out that all the other rhymes really worked, but cosmos and farrow just didn’t, even if I really wanted it to. After all, I love fuschia and pale pink cosmos. There had to be a way to work them into this book. But since there aren’t any insects called gizmos, at least not that I know of, I had to weed out the cosmos and plant yarrow. Then, Suzanne Kaufman worked her magic! 8 drafts ago 100 Bugs! featured two dragonfly species, two damselfly species, two butterfly species, two bumblebee species, ladybugs and lightning bugs. Walkingsticks, leafhoppers, spittlebugs and katydids weren’t in the picture. When Susan Dobinick, the original FSG editor who eventually acquired 100 Bugs!, first contacted me, she told me she wanted me to revise and include ten different insects. She also stipulated that I definitely had to include the bug all the kids liked, then she blanked on the name. Thank goodness “walkingstick” came to her before the end of the conversation because I had no idea what bug she was talking about. All of my favorite bugs were already in the book! She also said she wanted scientific back matter for the ten different plants and the ten different insects. Finally, she acknowledged that I had a full-time teaching job and a family, but told me she needed the revision within a month’s time. Did I panic? Maybe a tiny bit, but becoming a published writer was a goal I’d been working toward for twelve years. I was willing to go to any length to do what needed to be done. So, I researched a couple of hours before work and a couple of hours after work each day. A month later there were ten different bugs, and back matter for all the insects and flowers. 7 drafts ago 100 Bugs! only featured a boy, not a girl. But that changed when editor Janine O’Malley brought Suzanne Kaufman on board to illustrate the book. Not only did the boy gain the cutest little sister ever, he also scored a dog all in the same draft! Happy boy! 6 drafts ago 100 Bugs! started with the walkingstick spread. It’s true. I swear it. I know it’s hard to believe that the super cute opening spread with the brother and sister in bed didn’t exist, but that’s the truth. Originally, the title page had the brother and sister leaving the house. The old title page resembled the current walkingstick spread. But Suzanne had already come up with the gorgeous sunrise and sunset end papers. So, Janine wanted the story to start with the kids waking up. I reached out to Melissa Stewart, April Prince and Joannie Duris to help me brainstorm the verse. We sent emails back and forth, but nothing seemed quite right. So, I went to bed. When I rose with the sun the next morning, the phrase, “Explorers, explorers rising with the sun,” streamed into my head and a new beginning dawned. 5 drafts ago 100 Bugs! A Counting book ended with the lightning bug spread. But that was before we started with the explorers in bed. The beginning has to hold the end of the book. So, I wrote the “Hip! Hip! Hooray!” spread so that Suzanne could showcase the explorers back in bed at the end of their day. 4 drafts ago 100 Bugs! didn’t include the brother and sister holding the book 100 Bugs! in their hands. 3 drafts ago 100 Bugs! A Counting Book was titled 100 Bugs Out and About. Yeah, my original title was playful, but it didn’t emphasize the mathematical concepts in the book enough. So, we tried some other titles that were way too mathematical: 100 Bugs! 10 Ways to Count to 10 or 100 Bugs! Counting by tens to 100 or 100 Bugs! 10 groups of 10. Finally, Janine and the marketing department suggested 100 Bugs! A Counting Book—an inviting, but not confusing name. 2 drafts ago 100 Bugs! counted by tens on each spread. But that didn’t work because there was no way to illustrate all those bugs on each spread. So, I came up with the idea to create a single spread near the end of the book that would feature all 100 bugs! Janine liked the idea and passed it onto Suzanne. 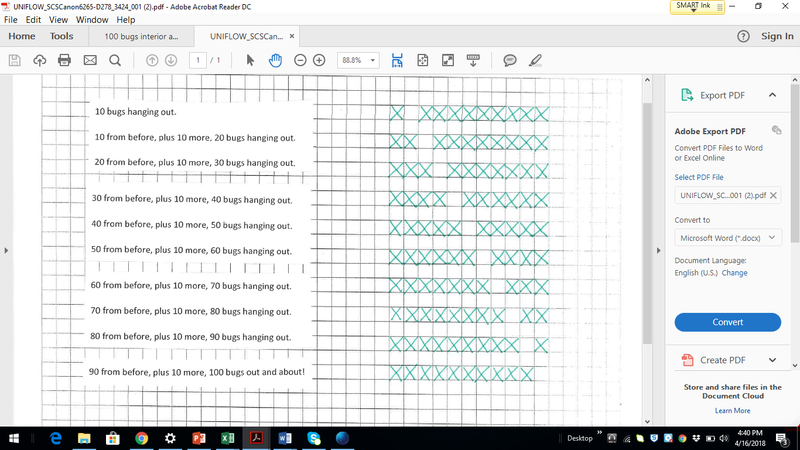 The first draft of that spread didn’t work because it alternated between a line of illustrated bugs and a line of text counting by tens. It was hard to see the number of bugs growing. So, I put the spread up on a SMARTboard at school to see my teaching colleagues’, Kristin Milton, Pam Trefry and Teresa Zuckerman reactions. They looked as confused as I felt. But, as always, they had a solution—move all the text to the left-hand side, the verso, and move all the insects to the right-hand side, the recto. It was a great solution but how could I explain it to Janine and Suzanne? I decided to draw up a mock spread. I copied and pasted the counting by tens lines into one document, printed them and glued them down onto the left-hand side of a piece of graph paper. Then, to save time and because I’m not the world’s best artist to say the least, I used exes to represent the bugs in the array on the right-hand side of the book. Then, I emailed it to Janine who emailed it to Suzanne. Somehow I hadn’t communicated clearly to Janine that the exes were supposed to represent fully drawn bugs. So, when I saw the new spread, it had all the text on the left-hand side and 100 exes on the right… oops! I laughed out loud and explained what I had meant. The third time worked, and Suzanne created a gorgeous spread. 1 draft ago 100 Bugs! didn’t feature any perched damselflies. What’s the big deal? Who cares, right? Well remember back in the beginning I told you that I wanted to write a book that distinguished between damselflies and dragonflies? Well, one of the easiest ways to tell them apart is to look at the wings of a perched dragonfly or damselfly. If they’re straight and open, you’re looking at a dragonfly. However, if they’re partially or completely closed, you’re looking at a damselfly. That’s the story of how one damselfly came to perch on the edge of the wishing well. It’s also the story of how 100 Bugs! A Counting Book transformed from a manuscript in my computer to a book on your shelf. Want to read more revision stories? Click here. 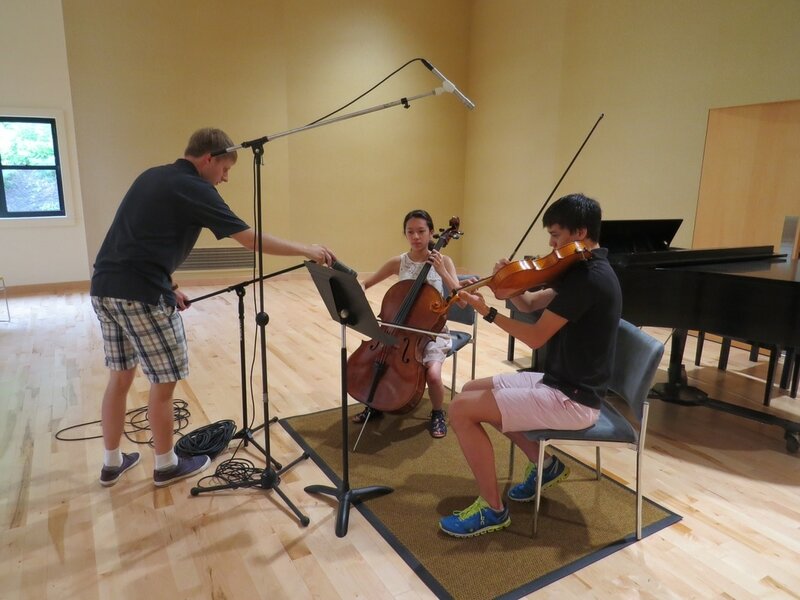 Click on the audio link to hear Anders on viola and Kaede on cello. They're playing a duet that Kaede composed which was inspired by Dan Zanes' Mariposa Ole. The duet is featured in 100 Bugs! A Counting Book book trailer. 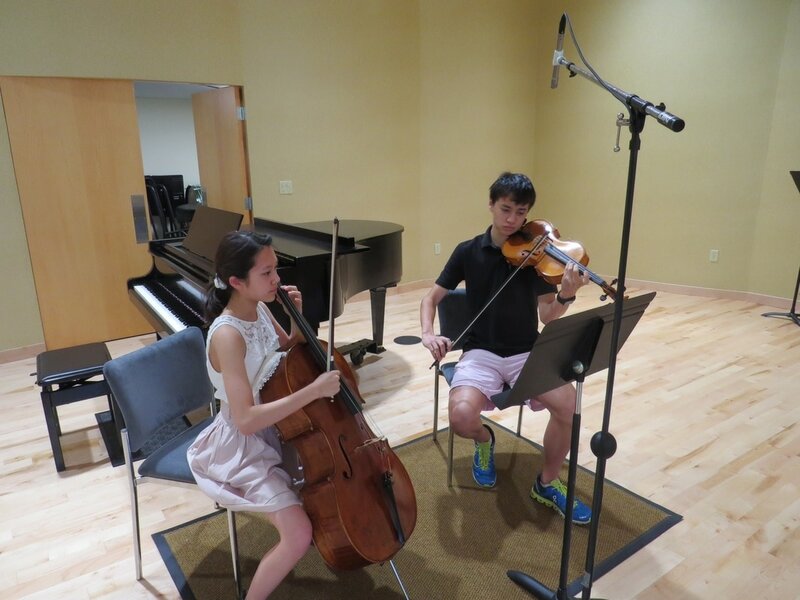 Many thanks to Joy of Music Program for letting us use their recording studio, Alec Seymour for recording the duet, and Naoko Ishidate for arranging the recording. The amazing Suzanne Kaufman shares a sneak peek at the artwork for 100 Bugs! A Counting Book ​coming spring of 2018. Enjoy!